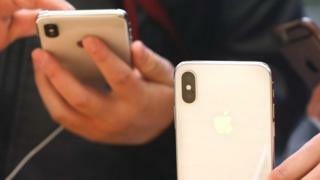 Some iPhone users have been left frustrated after an update to the iOS operating system started inexplicably auto-correcting the letter "i" to a capital "a" and a question mark. The affected version of iOS, 11.1, is available on iPhones and iPads. "I have a $1,150 [£877] telephone that can't read the letter 'i'," wrote Mike Murphy, a technology reporter for news website Quartz, on Twitter. Apple has described a temporary fix for the problem on its website. The fix involves editing the keyboard settings in iOS so that the right character, either an upper or lower case "i", is used. Apple has said the issue will be fixed in a future software update. Not all iOS 11.1 users have been affected, though there are plenty of comments online from those who say they have experienced the problem. An online discussion forum on Apple's website includes comments from victims of the bug. "This is super-annoying," wrote one.